When Thomson Bros. incorporated as Thomson Stationery Company in 1896, one reason may have been to raise capital for business expansion. Over the next few years, the company added space to “its already commodious quarters” in Nelson and moved to larger premises at 325 Hastings Street in Vancouver (while still hanging on to the Cordova Street location) (1). The firm also became “an important name on the [publishing] scene,” with titles like Gold Dust: How to Find It and How to Mine It (2). The photo below shows the bustling scene outside Thomson Stationery’s door on Hastings Street, their “Book Shop” sign readily visible down the street on the right side (3). 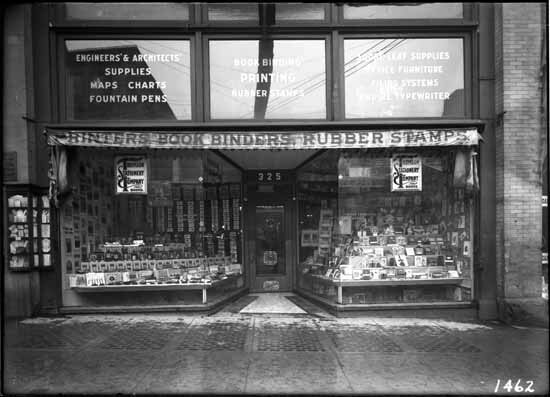 In May 1903, James and Melville announced that Thomson Stationery was for sale (it was operating only in Vancouver by this time) (4). But nothing seems to have come of their plans to withdraw until 1908, when Manfred J. Gaskell appeared on the scene. Formerly of the Musson Book Co. in Toronto and later with D.J. Young in Calgary, Gaskell took charge of Thomson’s retail operations. Then, in June 1909, the Thomson brothers retired and Gaskell took over Thomson Stationery with partners Edward F. Odlum and Albert Stabler, both of whom were also with the business for several years prior to the purchase (5). The centre of the store in the front section is devoted to displaying souvenir leather goods, scenic view books, post cards, etc., while the centre sections in the rear are utilized to show a general display of office devices from cash boxes to rotary mimeographs. To the right of the main entrance and extending the full 134 feet of the store in length, is the book department. Under the capable management of James Pollock and his experienced staff, this department keeps abreast of the times in all that pertains to a well stocked book store. In a future post, I’ll take up the rest of Thomson Stationery’s history under its new owners, but for now, let’s conclude with what happened to the Thomson brothers themselves. James and Melville may have retired from the book business, but they were far from done as entrepreneurs. Not long after selling Thomson Stationery, they became directors of and then gained controlling interest in The Trustee Company, a real estate development firm. In 1913, the company was renamed Mercantile Mortgage Company Ltd., and over the ensuing years Mercantile Mortgage and a spin-off business called Estates Investment Ltd. amassed significant real estate holdings in Vancouver and elsewhere in British Columbia, including many in Gastown. The Thomson family maintained control of Mercantile Mortgage and Estates Investment until the early 1990s (7). By this time, of course, James and Melville were long gone. James died in 1926, and Melville in 1944 (8). They are both buried in Vancouver’s Mountain View Cemetery. (1) The Miner (August 28, 1897), 1; “Books, Stationery and Fancy Goods: Thomson Bros,” Vancouver Daily World (December 17, 1898), 3. (2) Glennis Zilm, “An Overview of Trade Book Publishing in British Columbia in the 1800s with Checklists and Selected Bibliography related to British Columbia” (master’s thesis, Simon Fraser University, 1981), 277. 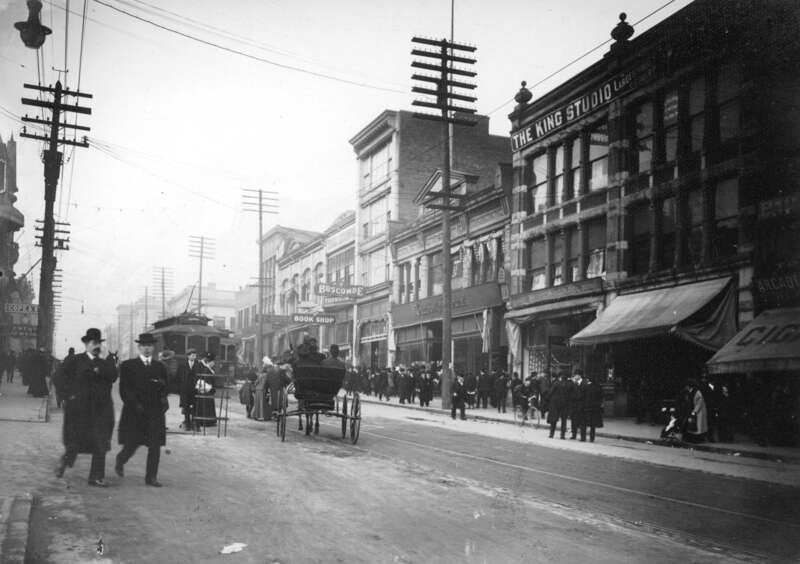 (3) CVA dates this photo as 190-, but the earliest it could have been taken was 1902, when Clubb & Stewart (also seen on the block) moved to Hastings Street. (4) Bookseller & Stationer (January 1902), 11; Bookseller & Stationer (May 1903), 124, 150, 152. (5) Bookseller & Stationer (June 1909), 36; Bookseller & Stationer (September 1909), 54-56. (6) Bookseller & Stationer (September 1909): 54-56. 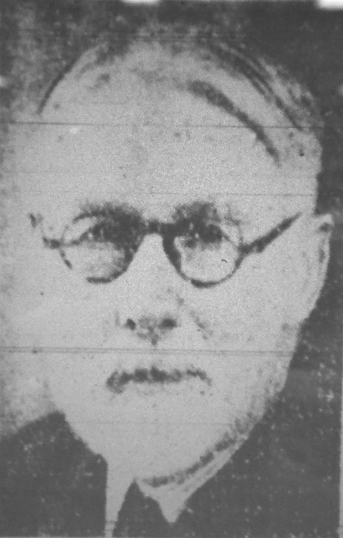 (8) Vancouver Sun (February 1, 1926), 12; “Pioneer City Stationer Dies at Oliver Home,” Vancouver Province (October 6, 1944), 10.